HomeAll BlogsHave You Saved Enough Money for the Retirement? If You Haven’t Saved Enough Money for the Retirement, You Still Have a Chance to Live Happily Ever After. In this article, I am going to discuss a solution and point to a source that will provide a step-by-step training on how to implement it. The only required prerequisite is that you must be open-minded and willing to take a step for a big change, no matter what age you are in today. Are You Stuck in a Low Paying Job? Is Retirement Even an Option? I recently reconnected with a friend whom I haven’t seen for over 20 years. When I knew him in the 1990s, he had worked at a coffee shop. Today, he is in his early sixties and still works at a coffee shop. My friend has a genetic condition, which with the age started acting up, and now he requires costly medical treatment. Because of this health condition, physical labor for my friend is becoming more challenging. Do you know how much money a salesperson in Starbucks is making annually? I Googled the average hourly rate; it’s somewhere from $10.00 to $15.00. If a person works 40 hours per week, his or her annual income is $22,400.00 – $33,600. In 2018, it is less than 200% or 300% accordingly of the Federal Poverty Level. I don’t see how such a hard-working individual could save anything for the retirement. Per Glassdoor.com, Starbucks even offers 401K with 100% employer matching contribution up to 5% of an employee’s pay. This opportunity would be a shame to miss, but taking advantage of it, which one should definitely do, means that his/her net income today is even lower. It’s Time for a Big Change! Become Your Own Boss. How will my friend live when he is no longer able to work? Today, while working full time, he barely makes ends meet. When he starts collecting his SSI checks, the amounts will be too low for him to pay his bills and yet enjoy his retirement doing what he loves to do at a leisure time. Will he and other people who worked really hard their entire life for a low pay, have an even tougher financial struggle when they retire? Unfortunately, the answer is “yes”. Instead of traveling, sailing, playing golf or doing other favorite activities, which all require money, these people will have to cut down their expenses to their most demanding needs in order to pay their bills. It’s sad, but I am not writing this article to blame the social security system. I’d rather discuss an option that will work for you and me despite the system. The only immediate solution I see for these hardworking people is in taking control over their future in their own hands and make a change NOW. Is it too late for a fundamental change if you are in your 40s, 50s, 60s? No, it is never too late to change the quality of your future life, even if you are in the 70s or 80s. However, the later you start the shorter time you’d have to enjoy the results. You need to change your mindset. You need to stop making other people rich. Instead of selling your time and labor for close to nothing, you need to start working for yourself. Are you ready to make that change and start your own online or offline business? Don’t quit your day job right away. Start building your business in addition to those tiring 40 hours of physical work per week. Spend 2 hours at night every day and 5 hours on the weekends (total of 20 hours per week) on starting your own business. If that’s too many additional working hours for you, start with 10 hours per week, but do realize that you’d achieve the same results two times slower. However, slowly moving forward is better than staying in the same place forever. You start by choosing your niche: at first, only one narrow topic targeting a group of people who share your interest. It’s time to actually enjoy what you are doing and be truly helpful to your customers. So, choose your niche based on your own passion. Make a point of helping these like-minded people in one way or the other. You must build the trust of your audience and make people want to turn to you for help and advice. I will continue using my friend as an example. His hobby is photography. He is quite good at it! He already has some studio equipment in addition to his fair cameras and set of lenses. Obviously, he doesn’t have money to rent or buy a studio. So, he wants to start working out of his apartment. Could he do it? Sure! Especially if he had a separate room in his place to use for the studio. Does he? No, he doesn’t. Can he still start his brick-and-mortar business out of his living room? Yes. Many successful companies began in someone’s basement. But, a photo-studio set in a living room doesn’t look very professional, does it? The wealthy clients would probably go somewhere else unless they already know my friend’s works and are absolutely in love with them. How could the potential customers know the works of the photographer? How would they know where to find this artist? A photographer or any other business owner needs to market his business offline and online. Since photography and coffee business don’t run into a conflict of interests, the shop my friend is working in might be a good place to use an old and proven word-of-mouth marketing technique. His employer may even welcome his framed works to decorate the walls of the shop and thus promote the artist. In your situation and line of business, there might be something else – just keep your mind open and be creative. No opportunity should be denied. If someone expresses an interest in a photo shoot, my friend should certainly take upon an opportunity. However, a brick-and-mortar business is not the cheapest and simplest solution and it still requires physical work from an owner unless there is enough capital to hire employees. Therefore, the initial focus has to be set on something simple, free or low-cost, and reliable. We are looking at a case with zero or a very low initial investment. Starting from nothing, we want to build a business within a year or two, which in a few more years will provide the retirement income. The cheapest type of online business is an Affiliate Marketing with its fast-growing demand and a network of participating retailers, including a giant like Amazon. In the modern world, any successful business should have an online presence and be marketed on the Internet utilizing Search Engine Optimization (SEO) techniques. How would we approach this? We create a website with a quality content that gets constantly updated and is easily found in response to the certain keyword searches. Does it sound too complicated? Don’t worry: Wealthy Affiliate (WA) got you covered. You don’t need to be technical. You don’t need to know how to write code. WA makes it unbelievably easy for you by providing easy to use tools, web hosting for your website, and training for online marketing techniques and entrepreneurial skills. Let’s look again at the photography business. Every photographer uses some photo equipment. He can write reviews on the equipment he is most familiar with. If he blogs on his website using the SEO knowledge from the training provided by WA, other photographers who are interested to learn, will be able to find his articles using Google and other search engines. The honesty builds trust. If you gave an honest and helpful review of a product to your website visitor, there is a good chance that this visitor bookmarks your site and comes again. But wait, are we making any money by writing reviews on products or services? Yes, we are! Nowadays, most retailers, including Amazon, offer affiliate programs. If you refer a customer to these online stores, you are getting commissions. 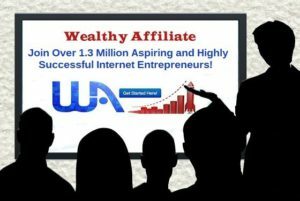 Wealthy Affiliate trains you in where to find and how to sign up for the affiliate programs. Amazon pays low commission, but you earn from them by the number of referrals as they have such a huge product selection. Some other companies offer commissions at a rate of up to 50% and even 75% of their product or service price. Besides writing reviews and being paid commissions on the referrals, we can use this very same website and local SEO to promote our brick-and-mortar business. So, when my friend-photographer becomes financially capable to open up his photo-studio, he’ll use local SEO techniques to make his studio easy to find in Google and other search engines, and promotes it on his website. The third use of this very same website is to create online classes. Photographers can teach others how to make quality documentary images and artistic photographs. With the use of modern technology, you can teach whatever you know best: health and nutrition, languages, musical instruments, financial planning – anything at all that will help others resolve their issues. You will offer students subscription on the training module of your website and collect membership fee. The fourth use of this website is to run an e-commerce store and sell an actual product. In our photography example, my friend could sell framed or unframed prints of his images as wall decoration, postcards, calendars, magnets and other souvenirs with his photographs, etc. I stated above that my friend photographer works 40 hours per week for his employer. When does he have time to do all that? I’ve never promised that launching a business is an easy deal. It’s not! If we want to accomplish great results in a short period, we need to roll up our sleeves and go for it with solid determination. As I mentioned at the beginning, we need to contribute weekly 10-20 additional hours after our day job to start this business. That’s a lot of work, but only for a limited time, and we can do it. You can do it! YES, YOU CAN. Once your website starts making some money, you should invest 25% of this additional income back into your business and use the rest 75% to decrease your hours at the day job if possible. If your type of employment does not allow a gradual reduction in working hours, wait until your daily earnings from your business match half of your pay per day at work, and go part-time freeing more time to work for yourself. Don’t overwork yourself for the additional income just yet; keep the same earning amount until your own business replaces your income from the employer. Then, quit your day job, and start expanding for an additional income. Remember, that a single review, which was written only once a long time ago will bring you income during several years. This is called “passive income”. You are no longer exchanging your time and labor for money. You invested your time once, had the work well done, and you profit from it many times over a long period. Once your business is established, it requires less of your time to run. You can now look into another niche and start another website. If you keep investing 25% of your profit back to your business. You should soon be able to hire a team working for you. You can use Fiverr.com, Guru.com or iWriter.com to outsource writing the content to a freelancer. It’s never too late to start doing what you really like, contributing to the other people’s wellness and helping them resolve their issues, improving your own lifestyle and breaking free from financial slavery. Start with choosing your niche: something that you are passionate about and that is helpful to others. The Affiliate Marketing is the easiest and cheapest type of business to start because it does not require your own product, storage space or any other physical assets. You only have to be able to write valuable content and run your website. Keep your eyes and ears open for other opportunities within your niche, but don’t jump to the completely different ideas. When the first direction you’ve chosen seems well managed, run on a routine basis and producing some income, reduce your day job hours if possible. Contribute more hours to your business and expand it within the same niche, or/and select a new niche and start another website.